After pulling a major upset in her first-round match against 2011 champion Samantha Stosur at the US Open, 17-year-old tennis player Victoria Duval spoke to “New Day” News Anchor Michaela Pereira about her journey, victory and aspirations. MICHAELA PEREIRA, CNN ANCHOR: Appropriate music for this next interview here. 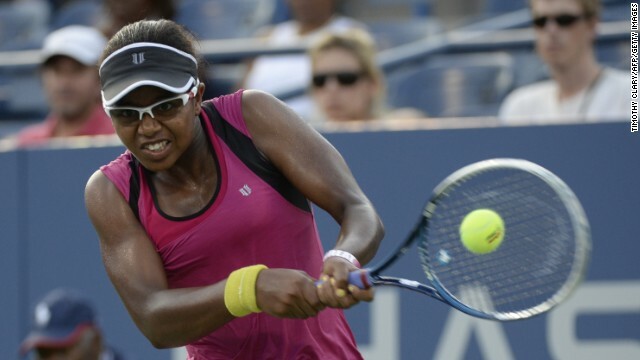 Just 17 years old, Victoria Duval has become an overnight sensation at this year’s U.S. Open. She was born in Miami, raised in her parents’ native Haiti. Victoria first picked up the racquet at age 7 just in order to pass the time at her brother’s tennis lessons, but on Tuesday night, she defeated a former U.S. Open champion in the first round. That stunning upset has put Duval who is currently ranked at 296th in the world firmly in the spotlight. PEREIRA (voice-over): She is the surprise sweetheart of the U.S. Open. But unlike so many of the pros, tennis was not always the dream for Victoria Duval. VICTORIA DUVAL, TENNIS PLAYER: I wanted to be a ballerina. PEREIRA (on camera): Who are the tennis players in the family, what happened? PEREIRA: She was going to be a ballerina, right? CEDRIC DUVAL, VICTORIA’S BROTHER: Yes, she started off wanting to be a ballerina, but I guess she just wanted to be like us. She wanted to follow in our footsteps. PEREIRA (voice-over): At just 17 and ranked 296th in the world, she pulled out a stunning upset overcoming 11th seed Samantha Stosur, a former U.S. Open champ. UNIDENTIFIED MALE: She’s done it! PEREIRA: She won the crowd over with her jubilant celebration and charm. DUVAL: I’m really excited right now. UNIDENTIFIED MALE: It was a good feeling. I mean, like eight, ten years watching and waiting for that moment. NADINE DUVAL, VICTORIA’S MOTHER: This is a dream and this is something, this is a passion. I’m happy for her. PEREIRA (on camera): Do you remember hearing your family in the stands? DUVAL: No, because the whole crowd was going nuts. The crowd just blurred them out. PEREIRA (voice-over): Victoria has overcome the odds before. As a young child she and several family members were held hostage at gunpoint during a robbery in Haiti and then in 2010, her father, Jean Maurice, a physician was in Port-Au-Prince when the earthquake struck, badly injured, he dug himself out of the rubble. DUVAL: Obviously, you know, we’ve experienced quite a lot and just having the hard work pay off on such a big stage, I was glad that God gave me that opportunity. PEREIRA: On the surface you would never know what this family had been through. They are close knit, joyfully celeb celebrating her win. Her brother wearing a shirt with the letters DON. UNIDENTIFIED MALE: Dreams over nightmares. PEREIRA (on camera): What does that mean at you? DUVAL: I look at the dreams part. PEREIRA: What are your dreams? DUVAL: To win all grand slams and becoming a major tennis player. PEREIRA (voice-over): No doubt this team is one step closer to making her dream come true. PEREIRA: Vicki told me that after that stunning match, after all that exuberance she got a text message from who, tennis legend, Billie Jean, it said “Congratulations, I’m really proud of you.” She was really excited getting that text message. She faces Daniela Hantuchova in the second round of play later today. We wish her well. She really is a tremendous young lady and what’s really interesting, talking to her coach, he talked about the importance of having that family support and they’re all with her in this. KATE BOLDUAN, CNN ANCHOR: You almost feel in that moment when she realizes, you feel her sheer, raw joy. It’s so cool. PEREIRA: She’s a really great kid with lots of energy and she really has fun out there. That’s the other thing that I noticed. CHRIS CUOMO, CNN ANCHOR: It’s an important thing for them to have especially early on. There’s all the pressure to push them through the brackets. It doesn’t really matter who she takes on next. She’s had her moment and anything else is gravy. PEREIRA: Even her coach said they’re concerned about the spotlight and all the pressure at 17, that’s a lot to handle, but I argued when you have that kind of family support, it does help buffer it a little bit. CUOMO: She may have the perspective that it’s just a game. PEREIRA: She told me life is short. She knows that all too well. CUOMO: They learned it the hard way. BOLDUAN: Good luck, good luck.